Double weave gauze. Made of organically grown unbleached cotton. This fabric stays the softest of all of the natural fiber diapers. Quantity discount savings. Save when buying in packages of 6. Save when purchasing in packages of 6. Newborn (birth to 2 months) 20" x 28" before washing, after washing about 19" x 27"
One-Size (2 months and up) 28" x 30" before washing, after washing about 27.5" x 27.5"
Large (12 -35 pounds) 32" x 35" before washing, after washing about 28" x 31"
Need an even bigger size? This is also available in Swaddle/XLarge size. How do you use a rectangular newborn flat? Fold in one end and it becomes a square! Then use the regular flat folds for square diapers from there, or just pad fold it. Shown is a size One-Size wrapped around baby with ends tucked in. No pins or fastener. Of course you can use a fastener but it works ok to wrap and tuck since a wrap style diaper cover put over it helps to hold it together. see more pictures. There are many ways to use these. It's not scary! They wash up so easy and the fabric is just amazing. The rave reviews are real and true. Try a six-pack. If you don't love them as diapers, you have the best dishcloths ever that will last for years and years. You can't go wrong owning a pack of flats. One-Size will work under size small covers or larger, but not size newborn, and will fit until potty learning. Size Large gives you one more inch in one direction and five more inches in the other direction. For babies over age 1, this extra fabric can be nice to give you a little more absorbency. But if you start with size One-Size you will stay with that size all the way through. Large is just a bigger option for those starting with flats when baby is older as a different, larger option. Size One-Size is about same size as our size Small/One-Size Birdseye Flat diaper, but this fabric is thicker so it is too big for newborn babies. Made of organically grown unbleached cotton. This fabric stays the softest of all of the natural fiber diapers. What is it? The words muslin and gauze mean the same thing. These are double weave, not the single weave that the popular swaddle blankets are. "Double weave" means that it is basically two layers of cloth woven together on the same loom at the same time to form one thicker layer. That's an oversimplification of the weaving process, but you end up with one layer of thicker fabric than you do from single weaving, yet it is still a one-layer fabric. Thicker means more absorbent, yet since it is still one layer, it has a nice, soft hand. It washes and dries easily and quickly! This is another option for economical organic cloth diapering. It is like the made of Organic Birdseye Flat Diapers in size One-Size, or about a half inch bigger, but the sizes do vary due to shrinkage variations. These contain slightly more cotton so they are slightly more absorbent. 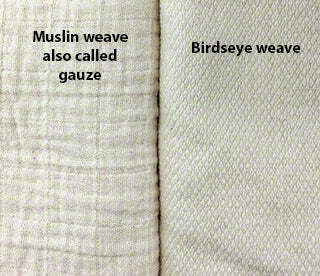 The muslin (gauze) weave is a different weave, slightly thicker, than the birdseye weave, but they really are very similar. The absorbency is comparable to a size medium red edge prefold, whereas the Birdseye (Small/One-Size) is just bit less absorbent than these; closer to a size small yellow edge prefold or a bit more than a yellow edge small but less than a medium red edge prefold. These double weave muslin (gauze) will win in a side by side absorbency test. The birdseye is thus trimmer. So, that means that this muslin diaper is really too big on a newborn baby since it is bulkier. Since they are unbleached, please wash several times on hot before first use to prep them. The natural cotton oils present in unbleached cotton must be washed off in those first several hot washes before full absorbency is reached. Easy to wash, quick to dry. Made in Pakistan. They work just like the Birdseye Diaper. See pictures. This is a relatively new item and we don't have many pictures of this on a baby yet, but the Birdseye pictures are very relevant since they are so similar. Watch our exclusive GMD How To Fold Flat Diapers Video Tutorial! Both of these Cloth-eez diapers start with the same organically grown cotton so the softness is very comparable even though they are woven differently. 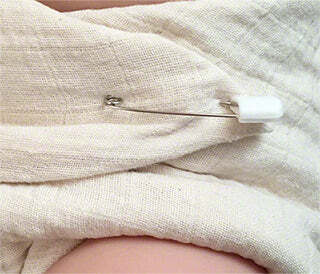 Cloth-eez Muslin Diaper is an organic cotton double weave gauze diaper. Made in Pakistan. These are very nice! They are fluffier than the birdseye, and absorb more too. I like to use them for naps, outings, and even boostered up at night. I hang dry, and like how soft and square they stay. I was a bit intimidated by these, but they are so simple to figure out. They are SO soft and can hold a lot of pee. They wash up really well and still look great after lots of uses. I'm so glad I decided to add some of these to my routine. Glad I gave into my fears and trusted all the reviews! If you’re on the fence about trying flats like I was, take Karen’s advice : order a pack and worst case you have the best most absorbent dish towels. I started with prefolds and still swear by my newborn prefolds (jelly roll the easiest solution in the middle of the night in my Opinion). After baby grew out I switched to Smalls but just got sick of the dry time. I have a new washer and dryer but my systems neee to be quick and efficient! Tried these flats and the Birdseye and I was completely unsuccessful at first. There is a legitimate learning curve to flats - I also don’t think I prepped them well enough out the gate. However, 6 months in i gave them another shot and I have the magic touch now! These are the only diapers I use now. I sold my prefolds (except my beloved newborn prefolds). The organic prefolds are a quick diapering option but they take quite awhile to dry so if you’re drying prefolds and flats in the same load you’ll be babysitting the dryer so that your prefolds dry but your flats don’t get over dryed! Got sick of the babysitting game. Now all I have are flats in the dryer. I even use the newborn size as doublers. Same material in every load so it washes and dries up the same. Now I tried the Birdseye large and it was luxurious but I didn’t like that the snappy would sometimes pierce through the fabric. With the Muslin snappy does not. (I tried pinning but I still don’t have the hang of it!) My only question is will the one size Muslin really last through potty learning? My babies all have high rises and I for sure won’t be able to origami fold much longer but I’m worried if I size up to large that the diaper won’t fold nicely in a square. For now, I’ll just keep using these lovely one size! Using the Birdseye flats as my dish towels and the wipes as napkins. Oh how I love GMD products!!!!! !